You might find it absurd that I am even writing an article to answer the question what is a W9, but I assure you we get asked this question in our practice more than you could imagine. Our clients get a request from their customer for a W-9 and they panic. Why would they do that? I am not an individual, I am a company. Does that mean that the IRS will add up all that I get paid from all my customers and then expect me to pay taxes on all that? What about payments I get from my customers that are expense reimbursements? Do they report that? Believe me, I understand your frustration and I will attempt to clear up some of the confusion and anxieties about a W-9, its purpose and the requirements for completion, as it relates to the types of business we most often service. SO WHAT IS A W-9? A W-9 form (Request for Taxpayer Identification Number and Certification) by its simplest definition is used collect identifying information so that payments made to you or your company can be reported to the IRS. More specifically the w-9 form is intended to collect a Tax Payer’s Identification Number (also call Employer Identification Number or EIN) or Social Security Number for an individual or business, the individual’s name or business name, current address, the type of entity and certification that the individual or business, is not subject to backup withholding. I know, I know, you are still wondering what backup withholding is, I promise I will get to that. The information submitted to your customer or client on the W-9 is then used to issue a 1099 at the end of the year if they paid you $600.00 or more during that tax year for your services. Keep in mind that the IRS does not expect you to pay taxes on the gross amount reported through your 1099s. After all you are a business with expenses and it is expected that you will have these deductions. However, the IRS does expect that your gross reported revenue on your tax return will be at least as much as your vendors have reported to them. With that said, not every business or business entity is required to get a 1099 at the end of the year from their customers. If your company is organized as a corporation or you are a non-profit organization, you do not receive a 1099 for services income at year end. However, attorneys fees are typically reportable on a 1099 even if the attorney or firm is organized as a corporation. Also if your business is a provider of material goods or utility services you do not receive 1099 from your vendors. So to summarize, if you are in the service industry and you are organized as any entity other than a corporation or non-profit you will be subject to receiving a 1099 form from your customers. 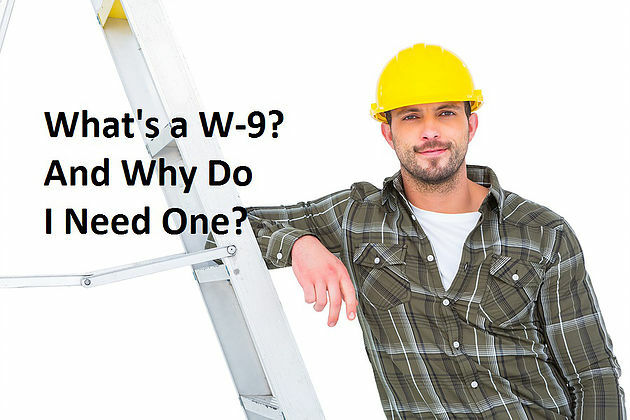 While you are all worked up about having to complete a W-9 and why, you need to also understand that as a business you are required to get a completed W9 from your vendors so you can be compliant in completing 1099s for your subcontractors, consultants, attorneys and any other vendors you work with in the service industry that you pay $600.00 or more for the year, that are not corporations, not non-profit, not suppliers of material goods or utility services. While you as an entity might be exempt from receiving a 1099 you are certainly not exempt from sending them out. There is a common misconception that if the vendor you work with is not an individual but is a company that is setup as a disregarded entity, you do not have to send them a 1099. Now that you know this is not the case, you better get started sending out those W-9s, so you can be compliant going forward. The Backup withholding rate is 28%. If a vendor you are working with is subject to backup withholding then 28% of any payments you make to them has to be withheld and remitted to the IRS. Wouldn’t it be great if you never have to wonder about backup withholding, W-9, 1099 and whether you are in compliance with IRS requirements. If you are a client of A Bookkeeper 4 U, then you don’t have to worry. How do we eliminate the W-9, 1099 backup withholding haze? It’s simple. We complete a W-9 for each or our clients and keep it on file to make it available to our clients’ customers. Additionally we collect W-9’s from our client’s vendors so there is no scrambling at year end to get 1099s out the door and keep our clients compliant. Feel free to contact us at 570-939-3922. Have a fantastic day! ©2018 A Bookkeeper 4 U - Do not copy. All rights reserved.